A charging cable is seen connected to a Nissan Leaf electric car. TOKYO -- Nissan Motor may get a boost from a deepening relationship with Mitsubishi Corp., Japan's biggest trading house, as access to battery materials becomes a priority amid the industry's push into electric vehicles. Mitsubishi Corp. on Tuesday said it plans to double its stake in Mitsubishi Motors, of which Nissan is the biggest shareholder. 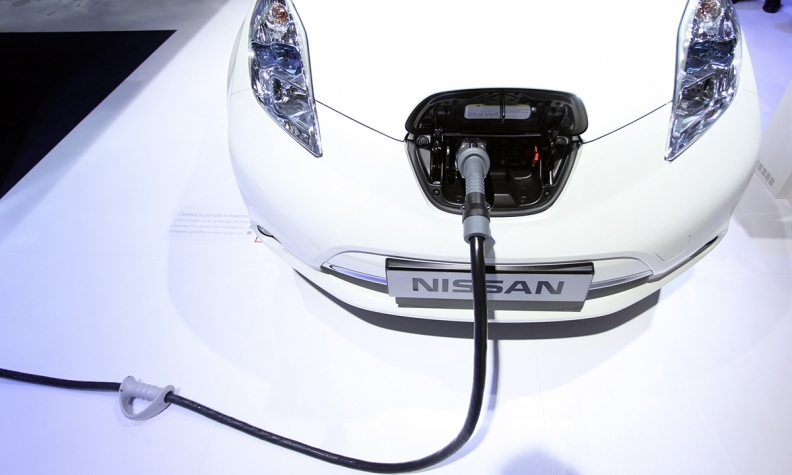 The trading company, which also owns mining assets, could be able to secure the lithium, cobalt, rare-earth metals and other battery metals necessary for the expanding EV business being developed by Nissan and its partners, according to Seiji Sugiura, an analyst at Tokai Tokyo Research Center in Tokyo. "Via Mitsubishi Motors, it's likely Mitsubishi Corp. will boost its business relationship with the Nissan alliance," Sugiura said by email, referring to the partnership between the two Japanese automakers and Renault that was fostered under Carlos Ghosn, chairman of all three. "Mitsubishi Corp. could invest in lithium, rare earths and other metals and become a supplier" for the alliance, he said. The Mitsubishi-Nissan connection may reap benefits similar to other Japanese companies like Toyota Motor, whose trading arm -- Toyota Tsusho -- recently took a stake in an Australian lithium miner. Since 2010 until the end of last year, Nissan has sold about 300,000 of its Leaf EVs. That compares with Tesla's sales surpassing 250,000 last year since its first Roadster rolled out in 2008. Neither Mitsubishi Corp. nor Nissan were immediately able to comment Wednesday. Mitsubishi Corp. said in a filing Tuesday, which laid out the rationale for doubling its stake in Mitsubishi Motors, that it's considering deeper involvement in the automotive industry in light of the "rapid and significant changes," specifically electric vehicles and autonomous cars.